Involves an imbalance of power – the aggressive person uses some sort of power over his/her victim. He or she may feel powerful because they are popular, physically stronger, or have access to embarrassing information. Both types of bullying often go hand-in-hand. Research studies show that offline bullying is more common among middle school students, but online bullying tends to be more common among high-school students. Also, girls are more likely to be victims of cyberbullying and yet they are also more likely than boys to be the person who uses cyberbullying to hurt someone else. Boys are more likely to bully in person. 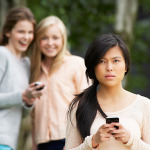 Regardless of what role a person plays, being involved in bullying both online and offline is connected with certain negative psychological, social, and academic consequences, including low self-esteem, trouble with sleeping, relationships problems, depression, and less success in school.